The most overlooked piece of gear, the belt. For a pistol to be worn all day in town or in the field, the belt, holster, and ammo pouch must be sized and all work together as a unit. 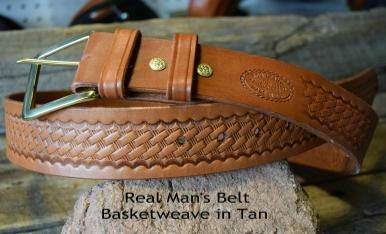 This belt will last decades and maintain it’s strength and support. We recommend 1.75″ for most applications. This is the American standard belt width for Carharts, Levis, Wranglers BDU/ACUs etc. If you wear a suit, the loops are generally 1.5". All belts come with two leather keepers. The solid brass buckle is held on with - "Chicago Screws" (will need to be periodically tighten, so you don't lose them) and can be easily replaced with your own buckle. We make our belts (For Real Women as well) to accommodate wearing a holster and ammo pouches. Made from a single, thick piece of saddle skirting. The 1.75" belts are wide, thick belts, you will have to work them through each loop of your jeans. Each belt has seven holes, spaced 1" apart. Guys: if you have over a 48" waist measurement , we highly recommend a 1.75" belt. This will avoid the "kite string" around the grain sack effect. The wider belt will be far more comfortable for you. Take an existing belt and lay it flat, measure from the end of the buckle to the hole that you use most (don't measure a belt that stretches). Again don’t over think this. 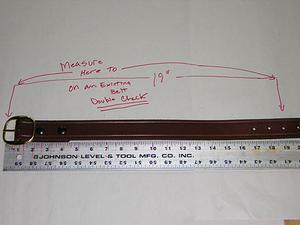 Double check by running the tape measure around your waist through the belt loops with no belt on. Don't give us a stamped measurement off another belt. Generally, this measurement will be larger than you think your waist size is. We have made thousands of belts correctly, because the correct measurement was given. Therefore, we don't want a pant size, or an overall belt length, your best guess or an estimate of what you want your waist size to be... please measure twice, so that we can cut once, accurately.